Made from bright shiny metallic plastic. 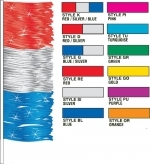 Metallic Poly Fringe antenna flags measure 28 in x 9 in and are sewn on a white heavy duty 32 in sleeve. 12 Color Combinations Available. Packaged one dozen flags per package. Made from Brilliant Metallic Plastic. Call for discounted pricing on more than 5 Doz.